#Humblebrag: Readers asking about our fine work-of-art ‘treasure’ map in the July issue is just exhausting, ya know? A boastful social media post ever-so-thinly disguised as a complaint — it’s called a humblebrag. Well, I’ve been inundated with compliments and queries about the map that ran across two pages in the latest Advocate magazine. Of course, we love the attention. It just shows that our readers have a good eye for something special. After all was done, he explained his process (and I felt kind-a bad). First, he sketched the map in pencil. Then he made a frame from liquid frisket, a material that hardens to create a border so that paint will not bleed. Then he brush painted the background before peeling off the dried frisket. Using extremely thin Italian brushes, he painted the street lines and used a technical pen to write street names. Based on the text of the story, he separately illustrated anecdotes — bikes, trees, the spillway, Lakewood Theater, Swiss Avenue mansions, a UFO — the same way. Then he had our photo editor, Danny Fulgencio, photograph the art and, separately, the smaller illustrations, so he could load them onto the computer and put it all together, later adding numbers corresponding with our list. 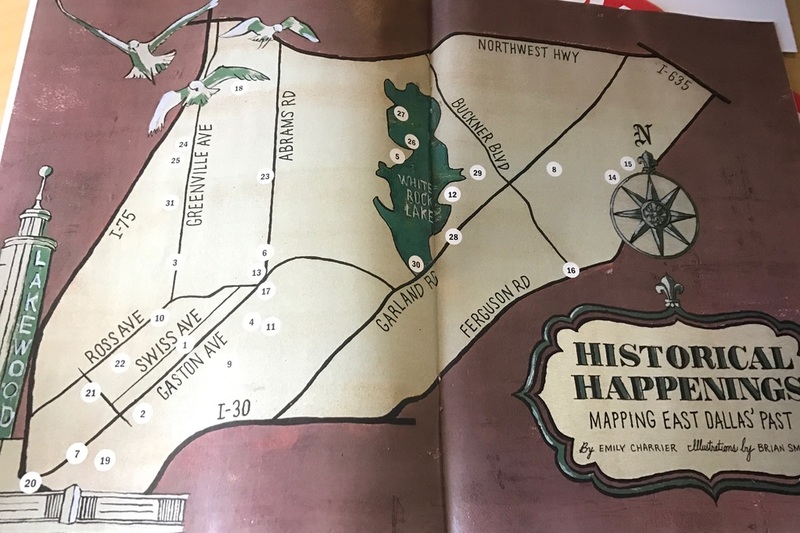 The first map he completed actually was for the East Dallas Advocate magazine. The editors liked it so much that we asked him to do one for Lake Highlands Advocate and Oak Cliff Advocate. It was around that time I recall him saying he did not know what he had gotten himself into. He worked through the Fourth of July holiday to get it done. What a guy. A digital version of our history maps can be located here.